Charles Dana Gibson was one of the most influential of American illustrators and cartoonists, best known for the assured pen drawings of social subjects that he contributed to magazines, and especially the ‘Gibson Girl’ – a term that has entered the language. 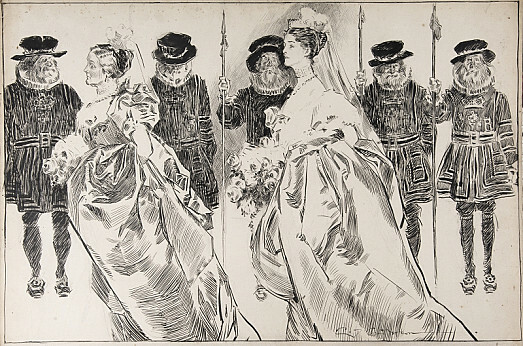 Charles Dana Gibson was born in Roxbury, Boston, Massachusetts, on 14 September 1867, the son of a salesman for the National Car Spring Company. Growing up in Flushing, Long Island, New York, he revealed his artistic skills at an early age, and received encouragement from his parents. At the age of 11, he worked with the New York architect, George Browne Post, and, at the age of 13, spent two years studying with the sculptor, Augustus Saint-Gaudens, stopping only to complete his education at Flushing High School. Then, in 1884, he spent two years in professional training at the Art Students League of New York, while supporting himself as a commercial artist. Regular contributions to Life and Tid-Bits, from 1886, helped Gibson save enough to travel to Europe to further his studies. While there, he visited the cartoonist, George Du Maurier, whom he greatly admired, and spent two months at the Académie Julian, in Paris. 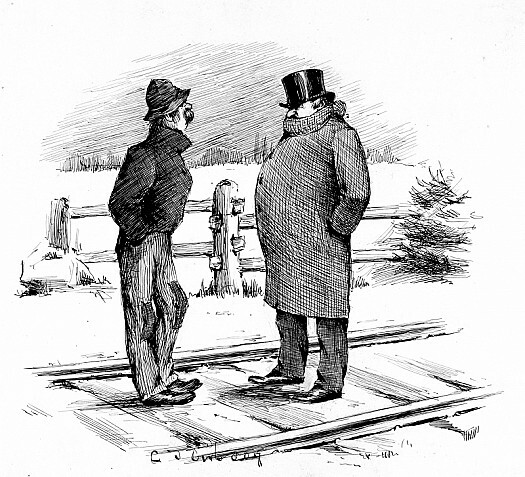 On returning to New York, he established himself properly as an illustrator, for various magazines, but especially Life, which featured his social cartoons as central double-page spreads. By 1890, his ideal female character – a resolute, modern young woman influenced by the work of Du Maurier – had become popularly known as the ‘Gibson Girl’. Of the 16 collections of cartoons that began to appear in 1894, The Education of Mr Pip (1899) and A Widow and her Friends (1901) are particularly notable. From 1888, Gibson had a parallel career as a book illustrator. In this field, he is best remembered for Richard Harding Davis’s Soldiers of Fortune (1897) and the American editions of Anthony Hope’s The Prisoner of Zenda (1898) and its sequel, Rupert of Henzau (1906). In 1895, Gibson married Irene Langhorne, the daughter of a Southern railway industrialist, and elder sister of Nancy (who, as Nancy Astor, would become the first woman to be elected a Member of the British Parliament in 1918). Of their two children, their daughter, Irene, would take George Browne Post III, the grandson of Gibson’s former teacher, as her first husband. The great popularity of the Gibson Girl, and of his work in general, led Gibson to sign a six-figure contract – unprecedented at any price – with Collier’s Magazine in 1902. This helped make him feel sufficiently secure to go to Paris, in 1905, to study painting. However, two years later, a financial panic reduced his income and forced him to return to New York to work as a black and white illustrator. With the outbreak of the First World War, in 1914, Gibson’s work began to contribute to anti-German propaganda. As a result, when the United States entered the war in 1917, he became head of the Division of Pictorial Publicity of the Committee of Public Information. In 1918, he was elected an associate of the National Academy of Design (becoming a full member in 1932), and, in 1921, he was elected to the American Academy of Arts and Letters (becoming a director in 1932). In 1920, Gibson acquired Life magazine, serving as its president and editor, and initially resuscitating it by introducing a large number of his own pen and ink drawings. However, when he refused to follow the trends of the 1920s, the magazine’s circulation declined and, following the onset of the Depression, it folded in 1936. (Its name was sold to Henry Luce for his new news magazine.) Having already returned to painting, he was given a solo show at the American Academy of Arts and Letters, in 1934, and a major retrospective at the Cincinnati Art Museum, in 1943. In that year, he received the gold medal of the American Artists Professional League for his distinguished contribution to American art. An influence upon an entire generation of American illustrators, Gibson died on 23 December 1944. Having been President of the American Society of Illustrators, he was elected to its Hall of Fame in 1974. His work is represented in the collections of the Library of Congress (Washington DC).